Yesterday a great coloring challenge started. 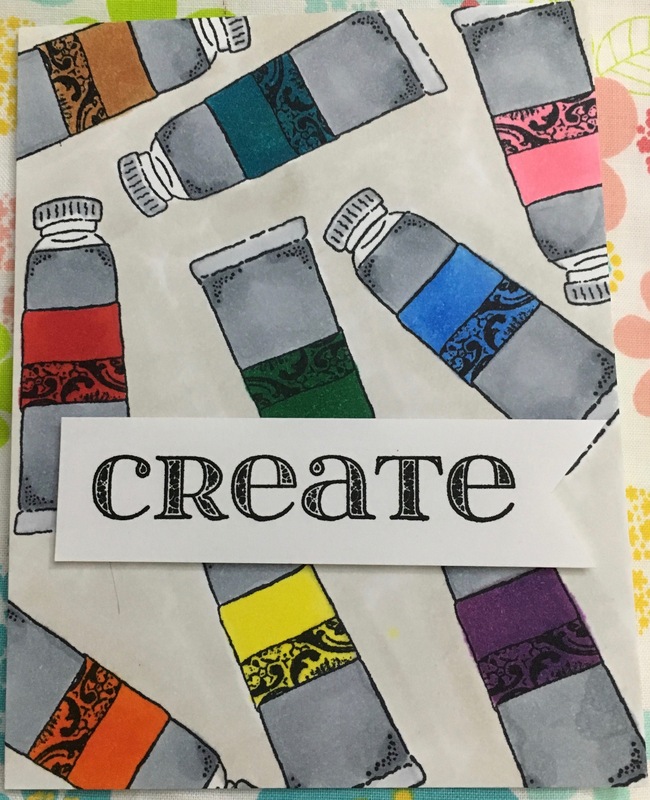 It’s called 30 Day Coloring Challenge and it’s hosted by Kathy Racoosin and you can find all of the information at her blog The Daily Marker. Basically she’s encouraging everyone to color for just 5 minutes a day with whatever coloring medium you want. You can upload your coloring to her blog, Instagram or to Facebook with the #thedailymarker30day She’s even offering prizes along the way. This is the fourth time for the challenge and it’s very fun and addictive! Today’s card was stamped with images from Impression Obsession. I created a background with the Impression Obsession Paint Tube #C9056 and stamped the image all over using Memento Tuxedo Black Ink. Some of the images were stamped off the paper. After all of the images were stamped, I started coloring the images with my Copic markers. The background was done with a wash of Colorless Blender in a watercolor brush and W1 which gives it was watercolor look. I stamped the word CREATE from Impression Obsession, stamp #C13297 and trimmed it down and created a ribbon end and foam popped it to the background piece. I then adhered everything to a white notecard. Thanks for stopping by and stay tuned for a new blog post soon!